Happy almost New Year! I’m up in Wisconsin on our annual ski trip so I’ll be celebrating the New Year with a long ski, a potluck dinner, bingo, catch phrase, something bubbly, and an early night. In the spirit of celebration I have the recipe for this Pear Ginger Fizz and variety of cocktail and mocktail recipes from around the web for you to enjoy. Thank you again for all your support, comments, encouragement and engagement this past year. I couldn’t do this work without you, so thanks! I’m excited for what next year has to offer and to bring you more great recipes and inspiration. Core the pear and place it in a high speed blender with the ginger lemonade. Purée until completely smooth then strain through a fine mesh seive. 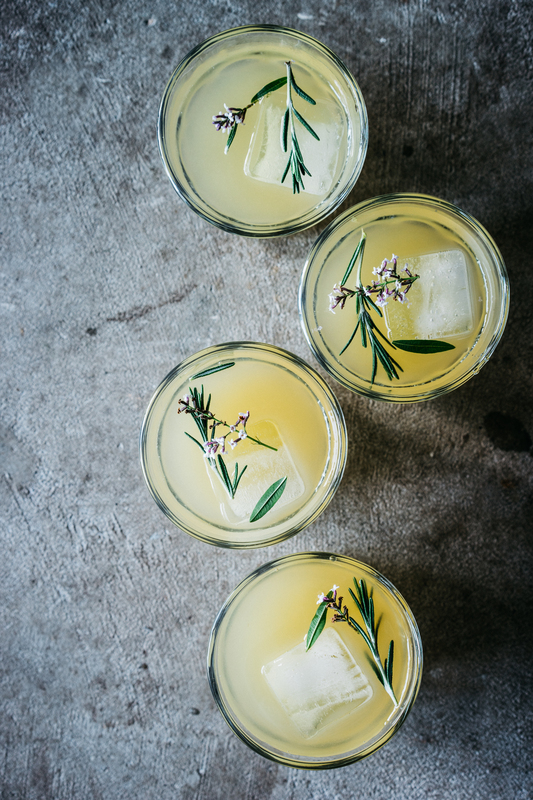 Divide between two glasses and top with kombucha, ice and a sprig if rosemary. that’s awesome drink . it gave me energy and keep me in good mood thanks for sharing recipe. Hey, thanks for posting a mocktail! I have family who don’t drink and want them to feel special on NYE too. The sparkling grape juice doesn’t do the trick. Do you mind if I link to this recipe in an upcoming cocktail post?